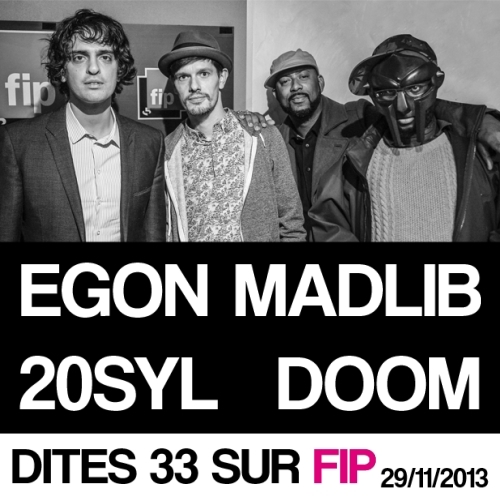 Egon, Madlib, 20Syl (French rapper/producer), and DOOM all recently made an appearance on French radio Fip together on the “DITES 33” program. The two hour program includes an interview with the group, some great music in between, and a 30 minute mix by Egon at the end. Unfortunately most of the interview is harder to hear as a French translator talks over them (makes sense why though, it’s a French radio broadcast), there are some insights that I found interesting. A few that stood out to me was when Madlib mentions the Lootpack album making him cringe now when he hears it (I imagine many artists feeling this way about their early music) and that when Freddie Gibbs received music by Madlib his thought was only to use the material for intros or interludes until Lambo convinced him to rap over the stuff. I was also impressed by the 20Syl tracks that were played during the program, I had never heard of him before and will try checking out more of his stuff in the future. Overall it’s a great radio program that’s worth listening to when you have the time. ps: This is my last Madlib related post for a bit, I swear! This entry was posted in Artist and tagged 20Syl, Egon, Madlib, MF DOOM. Bookmark the permalink.